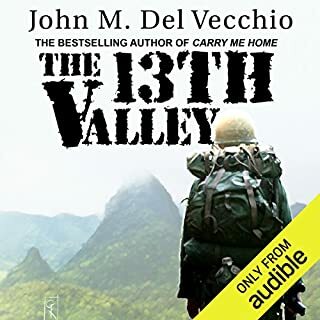 The 13th Valley follows the terrifying Vietnam combat experiences of James Chelini, a telephone-systems installer who finds himself an infantryman in territory controlled by the North Vietnamese army. Spiraling deeper and deeper into a world of conflict and darkness, this harrowing account of Chelini's plunge and immersion into jungle warfare traces his evolution from a semipacifist to an all-out combat-crazed soldier. When I first read this novel decades ago I was amazed. It's the truest, most honest book about the Vietnam war, from the field soldier's point of view, I've ever read. None of the movies you may have seen about Vietnam, or the other novels, come even close to telling what it was really like. I was there in 1969 and I attest that what you'll read in the book is true. All of it. If you want to know what Vietnam was like for the grunts in the field, the ones who actually fought the war and many of them died there, this is the book you want to read. It's also well written, but too long in parts. You'll end up skipping some of the less relevant parts. The author, Del Vecchio, was there with the 101st Airborne and knows what he's talking about. It is summer 2012. Charlie, a wealthy banker with an uneasy conscience, invites his troubled cousin, Matthew, to visit him and his wife in their idyllic mountaintop house. As the days grow hotter, the friendship between the three begins to reveal its fault lines, and with the arrival of a fourth character, the household finds itself suddenly in the grip of uncontrollable passions. What made the experience of listening to The Fall Guy the most enjoyable? The way the story builds in one direction, but then hits you with unexpected twists and turns. Author Lasdun knows how to throw in surprises you don't see coming, but that make perfect sense when you finally see how all the pieces fit together. Narrator Constant is excellent, especially his mastery of accents. 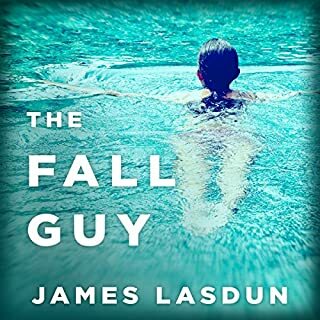 What other book might you compare The Fall Guy to and why? Who's Afraid of Virginia Woolf by Edward Albee. This play and The Fall Guy novel both have intense psychological dynamics among a limited number of characters. What does Charles Constant bring to the story that you wouldn’t experience if you just read the book? Constant is a master at pacing a story, and at providing accents that really make the characters come alive. This is true voice acting, not just bland narration. I listened to it in two sittings. The suspenseful developments kept me listening intently til the end, but I like breaking my Audible books into several listening periods. It's rare to find a literate book with well-developed characters. And to find a narrator who can present the characters exactly as they would be in real life. Detective Reed Mattox, just three months removed from the death of his partner, has turned invisibility into an art form. Switching to the K-9, taking over the graveyard shift, moving to a farmhouse miles outside of Columbus - his every move has become predicated on putting as much distance between himself and the outside world as possible. That distance is shattered, though, when bodies begin turning up in The Bottoms, the poverty-stricken section of town he is assigned to patrol. 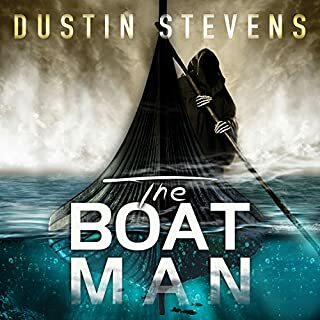 Where does The Boat Man rank among all the audiobooks you’ve listened to so far? The mystery element in The Boatman is strong. It's not til you get to the end that you have an idea what's really going on, and it's a shocker. I like the suspense. I'm not so keen about the gory elements. One reason I bought this audiobook is because the narrator, Charles Constant, is so excellent at his craft. I've listened to others of his books, and he's never let me down in any of his audiobooks. In a suspense mystery like The Boat Man, he really shines. Author Dustin Stevens knows how to create gritty, interesting characters. And Reed Maddox is a detective you want of follow. He's a flawed hero, but a fascinating one. Narrator Constant knows how to make him come alive, with vocal inflections, pacing, and a lot of depth and control to his voice. Not all narrators can do this. The same with Belgian Malinois, who is not an easy character to give voice to. The Boat Man is a satisfying audiobook experience. The context of the book, the dark and forbidding Bottoms area, is well drawn. Also, the way the story delves into the past, and shows how it affects the present in a sinister way will keep you on edge. And Malinois is the perfect foil for detective Maddox. What did you love best about Rewinder? Very interesting and innovative. This guy is a really good writer. His characters come alive, and the plot keeps you in suspense. Craig. 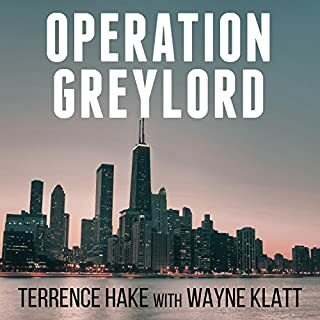 Operation Greylord was the longest and most successful undercover investigation in FBI history, and the largest corruption bust ever in the US. It resulted in bribery and tax charges against 103 judges, lawyers, and other court personnel, and, eventually, more than 70 indictments. And it was led by Terrence Hake, a young assistant prosecutor in the Cook County State's Attorney's Office in Chicago, who worked undercover for nearly four years. It's exciting and suspenseful. Also it has historical importance. It was the first time investigators were allowed to bug the chambers of high-level judges. Until then, there was no way to get at them. The man who did this was the same man who wrote the book: Terrance Hake. And he was an amateur! He knew nothing about how to go undercover to ferret out corruption. His life was at stake. He learned as he went along. And as a result, something like 100 judges and lawyers and other court officers were arrested, indicted, and spent jail time. Aside from the fact that this book is so historically interesting, it's also hard to put down because it's so exciting. Danger is everywhere. Until the end, you didn't really know if the good guys (the FBI and other agencies) will win or not. Also there are surprises thrown at you, which I won't mention because it would spoil your enjoyment of the story. Constant is a hell of a good narrator. He knows how to build suspense with his delivery when it's appropriate, and how to create interesting characters with his voicings. Also, you can tell the difference between the various characters because of his skill with different vocal nuances. 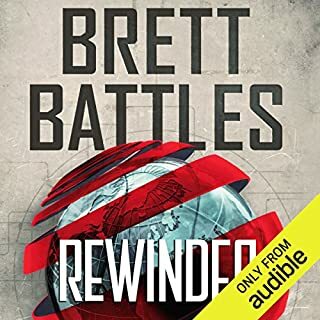 I did read the printed book first, and this Audible version adds so much more. It's like getting twice the enjoyment out of a single book. Yes, but since it's 10 hours long, no way. I've listened to this narrator Charles Constant before, and he's always good, with both fiction and non-fiction. But IMHO I especially love to hear him read historical material. 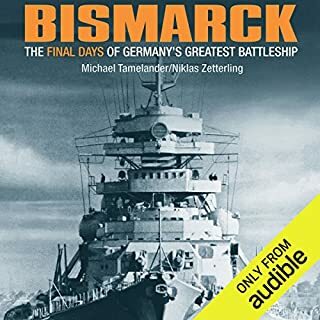 His narration of the Bismark book was first class. And in this Greylord book too, he knows when to give drama to a scene, without being melodramatic. Not all narrators can do this. It's 1963, and Chief Riley Bennett knocks on Dody Canfield's door informing her that her husband died instantly when his car struck a telephone pole. Not wanting to raise her three children alone, it isn't long before she brings home Frank Billings; and he's moving in. 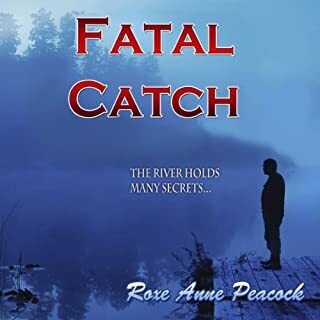 Mama sends Missy to take her little brother, Billie, fishing as Missy reels in slowly - bubbles begin emerging - releasing secrets, deadly lies, and terror on the Canfield family. 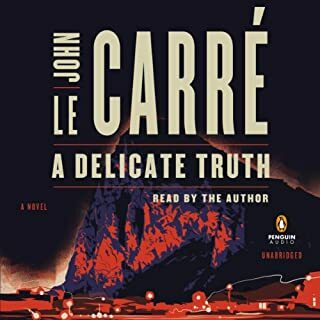 Where does Fatal Catch rank among all the audiobooks you’ve listened to so far? This is a good mystery novel, with a lot of gritty realism. It's suspenseful too. The narrator of the story is a 13-year-old girl, very well voiced by the book's voice-actor reader. The girl is Missy, and she and her brother Billie go through a lot that kids should never have to go through. It's a sign of the writer's talent that she manages to show how things looks through the kids' eyes, which is different than than through adults eyes. That's also a sign of the excellence of the voice-actor narration, that she can bring off this kids' world so convincingly. I haven't heard anything from Popi Ardisonne before, but I'm going to be looking for a lot more from her. I'd like to hear her voice-act an adult novel. She's got a wonderful, melodious voice. The climax of the book. When the mother brings home new "uncles", we adults know what's going on. The kids don't have this perspective. The effect of poverty is different on the kids too, than what we would expect it to be looking through adult eyes. What the writer does is hard to do, and she does it well. Be warned though if you're thinking of giving this book to your kids to listen to. There's too much of a danger-to-children element for it to appropriate for younger listeners. He is the most-decorated general in American history - and the only five-star general to receive the Medal of Honor. Yet Douglas MacArthur’s greatest victory was not in war but in peace. As the uniquely titled Supreme Commander for the Allied Powers, he was charged with transforming a defeated, militarist empire into a beacon of peace and democracy - "the greatest gamble ever attempted", he called it. Douglas MacArthur was one of the greatest and most fascinating war leaders America every produced, I think the only General to be awarded the Congressional Medal of Honor. 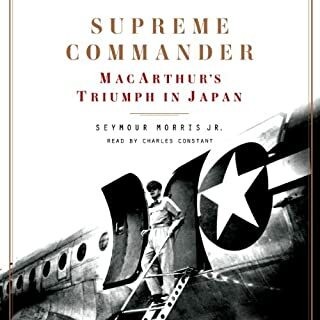 But as this book shows, MacArthur also excelled in his peacetime achievements. Almost no one expected that the bushido culture of Japan, steeped in militarism, could be turned around. Yet MacArthur did it. Morris's book also tells a lot about economics and politics, relating how MacArthur set the nation on a course to prosperity and democracy. The book is excellently narrated by Charles Constant. He has done other WWII histories, and has become a world-class vocal chronicler. I enjoy how he paces his story, and how his voice inflections can be grim, enthusiastic, momentous -- whatever is called for by the material. He's an extremely versatile narrator. Constant is becoming my first choice for voice acting of serious works. There are historical errors in Morris's book. My major quibble is that he doesn't take MacArthur to task for his treatment of General Yamashita, who was convicted of war crimes and executed. MacArthur pushed hard for Yamashita's execution. The verdict was appealed to him, and he refused to reduce it, even though it was clearly established that Yamashita was not responsible for the Phillipine atrocities. It was his subordinates who committed the Manila and other atrocities, in direct contravention of Yamashita's orders. For a very good recounting of this incident, and the flaw in MacArthur's character, read James Webb's "The Emperor's General". Overall, this book is interesting and informative. And the narration is excellent. 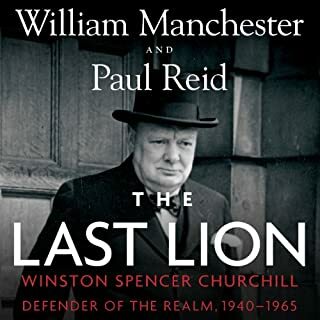 Would you listen to The Last Lion: Winston Spencer Churchill, Volume 3 again? Why? I was ready to feel cheated when I learned, in the introduction, that Wm Manchester didn't write this book. He assembled all the data. Paul Reid wrote the book after Manchester's death. So the "written by" Wm Manchester line is deceptive. But it's impossible to feel cheated. Reid is an excellent historian in his own right. He takes an extremely complex period of history, and a complex array of characters, and weaves them into a gripping and understandable web. Don't assume this book is only about Winston Churchill. He's the main character, and the main reason I picked up the book. But the book is also about the politics of World War II, and the economics, and the military campaigns, and the major personalities. Not just of Churchill, not just of the English leaders, but of the key players in Britain, America, Russia, and even Germany and Japan. What other book might you compare The Last Lion: Winston Spencer Churchill, Volume 3 to and why? Barbara Tuchman's "Guns of August". The same world-spanning grasp of history, and a similar narrative ability to make complex history understandable. Also, "First Blood: the Story of Fort Sumter" by Swanberg. A similar all-encompassing, multi-faceted history. Much shorter than the other two books though. Don't be ridiculous. This is an enormous and multi-dimensional book, that will give you a satisfying two months of listening. Beware of the introduction. It's not by narrator Clive Chafer, who is a very good narrator. It's by the writer, Paul Reid. Reid is an excellent writer, as I said, but he gets a D- as a narrator. That's not his thing. Fortunately, after the introduction, Clive Chafer comes on, and the narrating becomes professional and a pleasure to listen to.Craig. The sinking of the German battleship Bismarck - a masterpiece of engineering, well-armored with a main artillery of eight 15-inch guns - was one of the most dramatic events of World War II. She left the port of Gotenhafen for her first operation on the night of 18 May 1941, yet was almost immediately discovered by Norwegian resistance and Allied air reconnaissance. British battlecruiser Hood was quickly dispatched from Scapa Flow to intercept the Bismarck, together with new battleship Prince of Wales. A must read for any WWII Naval Historian! What did you love best about Bismarck? This is a serious maritime history, which is hard to find these days. It is excellently narrated by Charles Constant, who has the voice for it, and the intuitive feel for this type of material. Some of the sentences in the book are long and complex. Mr Constant knows where to pause verbally to break them into understandable segments. And he knows how to give emphasis without over-dramatizing. I'm a dedicated history reader (and listener). I wish some of my other favorite history audiotapes had been narrated by this man. Too often, the books are narrated by people who don't have a feel for the material, and don't how to pace it verbally. This, on the other hand, is a first-rate performance. What other book might you compare Bismarck to and why? Graf Spee by Dudley Pope. Guns of August by Barbara Tuchman. Along with this book, they are serious histories, related in a way that is respectful of the material. Which character – as performed by Charles Constant – was your favorite? Captain Ernst Lindemann. A master seaman, who took what care he could for his men under ultimately terrible circumstances. A Delicate Truth opens in 2008. A counter-terrorist operation, codenamed Wildlife, is being mounted on the British crown colony of Gibraltar. Its purpose: to capture and abduct a high-value jihadist arms buyer. Its authors: an ambitious Foreign Office Minister, a private defense contractor who is also his bosom friend, and a shady American CIA operative of the evangelical far right. So delicate is the operation that even the Minister’s personal private secretary, Toby Bell, is not cleared for it. A latter-day Jeremiah of espionage & statecraft. What would have made A Delicate Truth better? If it wasn't so predictable. And if the characters were not so cartoonish. LeCarre's first few books were wonderful, complex, and unpredictable. His last few run like this: The good guys will end badly. They will end badly after making utterly stupid mistakes that the protagonists in his first few novels would have considered incompetent. In "A Delicate Truth" the good guys, all of them, achieve nothing toward their moral and praiseworthy goal, because they act like rookies, despite their years of experience and knowledge of tradecraft. Something not by John LeCarre. Which character – as performed by John le Carre – was your favorite? If you could play editor, what scene or scenes would you have cut from A Delicate Truth? The last half of the novel. I used to love John LeCarre. That was when his characters, both good and evil, behaved intelligently. His last 4 novels involve characters who behave like rank amateurs. In "A Delicate Truth", the main protagonist doesn't see things coming, which a 3rd grade reader would see coming a mile away. There is never any surprise anymore in his novels. The good guys are moral. They are self-defeating. They will end up very badly. The instrument of their bad ends will be telegraphed long before the end of the novel, and reader will wonder how the protagonist could not have seen it coming, when everyone else could. Sad ending for John LeCarre. He used to be able to write fiction. Now he writes cartoons.